The Hop On, Stand Up Tour from RVA on Wheels places local comedians like Mary Jane French, pictured above, at the head of a festive trolley taking you around the city to drink beer, then work it off by laughing. Organized by the folks who brought us those thrilling Segway tours in downtown Richmond, the Hop On, Stand Up trolley tour has been described by one co-founder "as half a living room comedy show, half 'Speed' with Keanu Reeves." Sounds good to us, especially if the ghost of a maniacal Dennis Hopper is somehow involved. 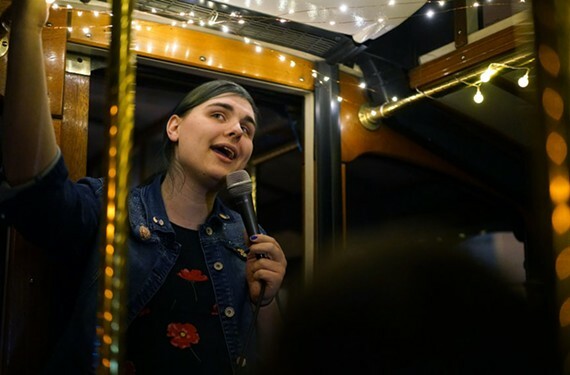 This monthly trolley tour, which features local comedians as your guides and onboard entertainment, begins at a local brewery, where giddy participants can meet and mingle over a complimentary beer or flight. From there, the signature RVA on Wheels trolley transports guests to two additional breweries (the route changes), with a free drink-of-choice available at each spot. Our writer who took the tour says that it's ideal for date nights, out-of-towners or residents looking for something different to do on a Friday night. Beer is never a problem. Just make us laugh.